One of the best-designed and easiest-to-use mobile DAWs that (quite a lot of) money can buy. Ease of use. Good design. Usual Amplitube tonal quality. Constant in-app purchase nagging. Expensive. Not a Universal app. With its third full version, IK's iOS edition of AmpliTube has made the jump from guitar amplification/processing and basic recording app to full-on DAW - although only if you're prepared to shell out a fair bit on IAP (in-app purchases). 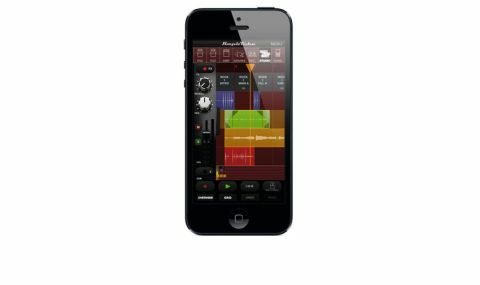 "Throw down another £7 via an IAP and you unlock four tracks of recording and the Master Effects Section"
Also available as a separate app for iPad (which we're not covering here), the unadorned AmpliTube includes 11 virtual 'stompbox' effects, five amps, five cabinets and two microphones, a single track for recording and playback, and the Loop Drummer auto-accompaniment drum player. You can unlock various additions to that line-up via IAP, but the basic bundle is fairly comprehensive in terms of tone design. Throw down another £7, however, and you unlock four tracks of recording and the Master Effects Section, which includes some basic send effects, a compressor and a 3-band EQ. Then, another seven quid lands you the Studio add-on (or you can drop £13 - or £19 on iPad - on the Total Studio Bundle, which gets you both at once). AmpliTube Studio is a simple 4-track DAW - 8-track on iPad - that enables your recorded audio parts to be moved on the timeline, faded, shortened, split and normalised. You get volume, pan and reverb send controls for each track, and an overview at the bottom. Loop and punch-in regions can be set on the timeline, and it all adds up to a decent albeit basic and quite pricey (£27) virtual studio, aimed primarily at guitarists and singer-songwriter types. All the usual IK IAP nagging is there, of course, with regular prompts to buy the iRig HD or more add-on packs, not doing their slightly IAP-happy reputation any favours - particularly with regard to Loop Drummer, which can only really be considered a demo in its default state. It's also a bit disappointing that AmpliTube isn't a Universal app, and annoying that it seems to have to 'optimise' the song prior to playback (causing a brief pause) more often than we'd like. Even so, there's no arguing that this is one of the best-designed and easiest-to-use mobile DAWs that (quite a lot of) money can buy.